Community leaders in the home town of a teenager reportedly involved in an Iraq suicide bombing linked to Islamic State have spoken of their shock. Talha Asmal's family say he was groomed online, and Downing Street described the case as "deeply concerning". But a pupil at Asmal's school told the BBC he believed the sixth former had been persuaded to join IS by someone in Dewsbury, West Yorkshire. Asmal, 17, travelled to Syria in March with a convicted terrorist's brother. Hassan Munshi, who is also 17 and from the same town, is still in Syria. His brother was detained for two years in 2008 after being convicted of making a record of information likely to be used for terrorist purposes. Speaking to BBC Radio 5 live, a friend of the Asmal family said he believed the teenager must have come under "some kind of peer pressure". Zubair Patel said the idea that a teenager would "go out and cross borders and go into another country and do whatever" solely because of online grooming "doesn't fit". Iqbal Bhana, a Home Office adviser on hate crimes, said if "we found out there was someone planting these kind of ideas into the minds of young people, converting them... we would want to confront and challenge them". Hassan Munshi's brother, Hammaad, was 16 when he was arrested in 2006. A jury heard he had spent hours viewing jihadist websites and downloaded guides to making napalm, detonators and explosives. He was convicted alongside two other men, one of whom was described as a "key player" in radicalisation via the internet. Mr Bhana, who is a friend of the Munshi family, said there was "no evidence to indicate" Hammaad Munshi had groomed the teenagers before they travelled to Syria. "My understanding is that he has rehabilitated himself, recognised the mistake he made, recognised the shame and disrespect he brought to his family." At least 11 people were killed in the car bombings carried out by four suicide bombers near the city of Baiji, north of Baghdad, on Saturday. 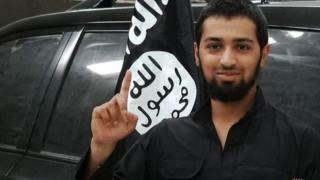 Social media reports linked to Islamic State said Asmal, going by the name of Abu Yusuf al-Britani, was among the attackers. Confirmation would make him Britain's youngest known suicide bomber. Another West Yorkshire teenager, Hasib Hussein, was 18 when he blew himself up on a London bus in the 7 July 2005 attacks. Dewsbury councillor Masood Ahmed described Asmal as a "typical teenager" and said there had been no signs he had been radicalised. Lorraine Barker, executive principal of Mirfield Free Grammar and Sixth Form, where Asmal was studying, told the Times he had been a "conscientious student". "We are all naturally utterly devastated and heartbroken". Talha Asmal's family say he was groomed. That makes him, in their eyes, a teenage victim, rather than a criminal or terrorist. Ten years ago, the UK had the same debate about suicide bombers from Yorkshire who killed 52 people in London in the 7/7 attacks. Today, the UK's police and security agencies have a wide range of powers and techniques to disrupt would-be terrorists. But the police can't arrest everyone - and evidence shows it is difficult to bring someone back from the edge, once they are radicalised. In two weeks' time, public bodies, including schools, will be under a controversial but groundbreaking new legal duty to prevent people being drawn towards terrorism. Critically, it is directly linked to other legal duties of "safeguarding" the young from harm. So this really thorny question of "prevention rather than cure" is where the debate is now shifting. The former independent reviewer of terror laws Lord Carlile told BBC Radio 4's Today programme MPs should be "working together" to produce solutions to radicalisation. He criticised social media companies which do not co-operate with the government and security services. Downing Street said the government wanted to work with social media firms to stop young people being targeted, but was against compelling them to help through legislation. David Cameron's official spokeswoman said the prime minister felt the case "underlines the need to do all we can to prevent young people being radicalised and, if they are thinking of travelling, to stop them". It comes as Kenya says a Briton was among 11 al-Shabab gunmen killed in a failed attack on a military base. Thomas Evans, 25, a Muslim convert from Buckinghamshire, joined the Islamist group in Somalia three years ago. At least 700 people from the UK have travelled to support or fight for jihadist organisations in Iraq and Syria, with the majority joining IS. The Home Office said since 2011 it had trained more than 160,000 people to identify and prevent extremism; excluded nearly 100 "hate preachers" and taken down more than 90,000 pieces of terrorist-related material from the internet.